Camo engagement rings are so cool for her! For a one-of-a-kind lady, only a one-of-a-kind ring will do. 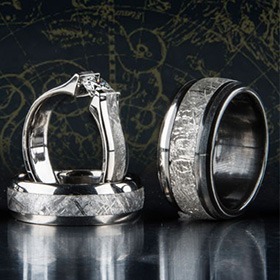 Titanium-Buzz is the best place to find a camo promise ring for her that will set her heart aflutter. Even though these camo engagement rings are meant to celebrate your favorite camouflage pattern, they'll do anything but blend in. So, get ready to get on bended knee in your favorite set of camo and pop the question outdoors-style with one of these exceptional womens camouflage engagement rings. Camouflage diamond engagement ring is perfect for your girlfriend. Your down-to-earth lady won't have to compromise between classic and contemporary when you surprise her with one of our camo promise rings for girlfriend. Selections feature glittering center-set diamonds or camo diamond engagement rings with above-the-cut diamonds, including square or classic princess-cut stones to fit her personality. Want the full package? 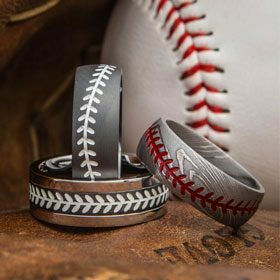 She also won't be able to help saying "yes" when you give her a stunning Women's Camo Bridal Set that comes with a show-stopping Realtree camo wedding band plus a matching camouflage diamond wedding ring with a sparkling diamond setting. Our womens camouflage engagement rings are made from durable and brilliant metals like titanium and cobalt chrome, both of which have superior wear-resistance to gold or platinum but aren't as expensive. She'll get better quality plus a selection of genuine diamonds with the added appeal of unique materials that last longer and withstand more. Pink camo engagement rings really stand out. We also have non-diamond camouflage engagement rings for the non-traditional bride-to-be, like our Camo Chick Bling Ring, featuring a gigantic 6-millimeter pink Chatham sapphire. If you have a bling-loving outdoorsy lady, then expect her to be overcome by this flashy pink camo engagement ring that puts the "glitz" in "glitzy." You can also celebrate your bride-to-be's girly side with one of our stop-in-your-tracks pink camo engagement rings in a classic solitaire style. There's nothing better than the no-nonsense look of camo paired with popping pink diamonds. These camo engagement rings for her are one-part girly, one-part rugged - perfect for your adventurous lady. Ready to get her excited about your next couples' hunting outing? These pink camo engagement rings are uniquely stylish, but they're also super-tough, and all of our womens camouflage engagement rings are crafted in America with tough-as-nails materials. In other words, they'll endure as she rocks them on your next hunt. And the best part? 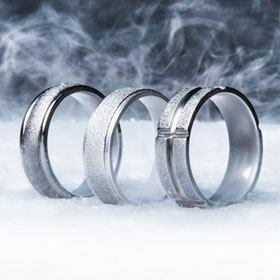 You can take advantage of optional engraving to ensure that each ring is tailor-made to her from you. If you see something you like but want to customize it, just email us, and we will work with you to find the perfect design. There's nothing we love more than a challenge, so don't hold back and don't be afraid to test us. 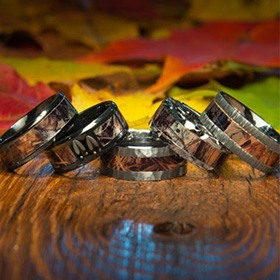 And if you want the full camo experience, check out the complete selection of camo rings at Titanium-Buzz.